Thanks to some gentle chiding by my pal Greg Heo, I decided to slightly refine the property initialization code in the Renderer class. Rather than use implicitly-unwrapped optionals for members that require long-winded initialization, I refactored the creation of the vertex descriptor and render pipeline state into their own static methods. John Sundell gives a good overview of alternatives here. I find closure-based lazy vars distasteful, so I took the “lightweight factory” approach. Do a git checkout step2_1 to get a version of the project with the initialization refactorings applied. And now, back to our regularly-scheduled programming. Because we’re currently writing a solid color from our fragment function, the 3D nature of the model isn’t really apparent. Let’s make a small modification to the fragment shader so we can visualize the eye-space normal of the model 1. If you run the app now, you’ll notice that portions of the model that shouldn’t be visible are. It’s as though the triangles that comprise the model are being drawn without regard to which should be nearer or farther to the camera. That is, in fact, what is happening. To fix this issue, we need to tell Metal to store the depth of each fragment as we process it, keeping the closest depth value and only replacing it if we see a fragment that is closer to the camera. This is called depth buffering, and fortunately, it’s not too hard to configure. Depth buffering requires the use of an additional texture called, naturally, the depth buffer. This texture is a lot like the color texture we’re already presenting to the screen when we’re done drawing, but instead of storing color, it stores depth, which is basically the distance from the camera to the surface. First, we need to tell the MTKView which pixel format it should use for the depth buffer. This time, we need to select a depth format, so we choose .depth32Float, which uses one single-precision float per pixel to track the distance from the camera to the nearest fragment seen so far. If you were to run the code again at this point, you wouldn’t see any improvement. We still need to tell Metal how to interpret and write to the depth buffer. The depthCompareFunction is used to determine whether a fragment passes the so-called depth test. In our case, we want to keep the fragment that is closest to the camera for each pixel, so we use a compare function of .less, which replaces the depth value in the depth buffer whenever a fragment closer to the camera is processed. We also set isDepthWriteEnabled to true, so that the depth values of passing fragments are actually written to the depth buffer. Without this flag set, no writes to the depth buffer would occur, and it would essentially be useless. There are circumstances in which we want to prevent depth buffer writes (such as particle rendering), but for opaque geometry, we almost always want it enabled. git checkout step2_2 to view the code up to this point. The art of illuminating virtual 3D scenes is a deep and much-studied field. We will consider a very basic model here, just enough to create a passable shiny surface. Our basic model calculates the lighting at a particular point as a sum of terms, each of which represents one aspect of how surfaces reflect light. We’ll look at each of these terms in turn: ambient, diffuse, and specular. The ambient term in our lighting equation accounts for indirect illumination: light that arrives at a surface after it has “bounced” off another surface. Imagine a desk illuminated above by a fluorescent light: even if the light is the only source of illumination around, the floor beneath the desk will still receive some light that has bounced off the walls and floor. Since modeling indirect light is expensive, simplified lighting models such as ours include an ambient term as a “fudge factor,” a hack that makes the scene look more plausible despite being a gross simplification of reality. For the time being, we lift the definitions of ambient intensity and base color out of the function. We’ll eventually pass them in as uniforms, since we want them to vary from object to object (and maybe from frame to frame). Ambient illumination produces a flat-looking appearance, since it assumes that indirect light arrives uniformly from all directions. git checkout step2_3 to view the code up to this point. Diffuse illumination represents the portion of light that arrives at a surface and then scatters uniformly in all directions. Think of a concrete surface or a matte wall. These surfaces scatter light instead of reflecting it like a mirror. Since we thought ahead and already have the surface normal and position in world space2 available in our fragment shader, we can compute the diffuse lighting term on a per-pixel basis. We need to normalize the surface normal in the fragment shader even if each vertex supplies a unit-length normal, because the rasterizer uses linear interpolation to compute the intermediate normal values, which does not preserve length. We calculate the direction to the light, L, as the vector difference between the world-space position of the light and the world-space position of the surface. This vector also needs to be normalized, since it can have arbitrary length. To compute the diffuse light intensity being reflected from the surface at this point, we take the dot product between N and L, which will be 1 when they are exactly aligned, and -1 when they are pointing in opposite directions (e.g., when the light is behind the surface). Because a negative light contribution would produce odd artifacts, we use the saturate function to clamp the result to the range of [0, 1]. We add the diffuse intensity to the ambient intensity to get the total proportion of light reflected by the surface. Then, as before, we multiply this factor by the base color to get the final color. git checkout step2_4 to view the code up to this point. There is another component to illumination that is important for surfaces that reflect light in a more coherent fashion: the specular term. Surfaces where specular illumination dominates include metals, polished marble, and glass. The reason we need the world position of the vertex is that the vector from the viewing position to the surface affects the shape and position of the specular highlight, the exceptionally bright point on the surface where the most light is reflected from. Specifically, we’ll use an approximation to specular highlighting devised by Blinn that uses the so-called halfway vector, the vector that points midway between the direction to the light and the direction to the camera position. By taking the dot product of this halfway vector and the surface normal, we get an approximation to the shiny highlights that appear on reflective surfaces. Raising this dot product to a quantity called the specular power controls how “tight” the highlight is. A low specular power (near 1) creates very broad highlights, while a high specular power (say, 150) creates pinpoint highlights. If you’re interested in the theoretical grounding of the halfway vector, consult papers on the microfacet model of surfaces, first popularized by Cook and Torrance in 1982. If you run the code at this point, you should see a red teapot with a new, shiny white highlight. Our virtual scene is starting to look a little bit truer to life. Of course, we still have a long way to go on the road to realism. git checkout step2_5 to view the code up to this point. Most surfaces in the real world are not uniformly smooth or rough, nor do they have a single uniform color. Painted surfaces chip and wear unevenly over time. Metal statues develop patina. Wood and marble have an identifiable and distinctive grain. Many of these variations can be captured with the use of texture maps, which provide a way to “wrap” an image over a surface in such a way as to supply color information in a much more detailed manner than supplying a per-surface or even per-vertex color. A texture map is just an image, but in order to know how it should wrap and stretch over a surface, each vertex has a 2-D set of coordinates–called texture coordinates–that indicate which texel (the texture equivalent of a pixel) should be affixed to that vertex. The texture coordinates are interpolated between vertices (just like the position and normal) to determine each fragment’s texture coordinates, which are what we will actually use to “look up” each fragment’s base color. You can read this article for more about texturing in Metal, but we’ll cover the essentials below. In Metal, textures are objects that conform to the MTLTexture protocol. We could ask our device to create a blank texture and then fill it with image data we load from a file, but there’s an easier way. To make textures at run-time, we need images to load. 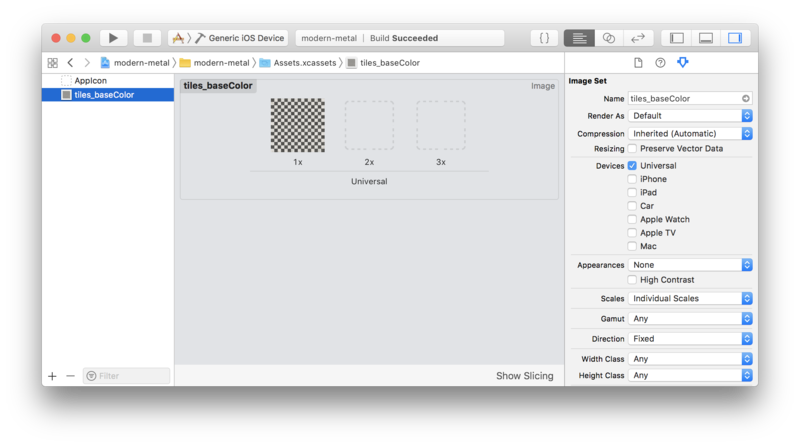 It’s advisable to use Asset Catalogs to store these images, both because it makes loading them with MetalKit easier, and because Asset Catalogs support App Thinning, which can greatly reduce the size of the app bundle your user needs to download. Note that we can supply an options dictionary to affect some aspects of how the texture loader works. One of the options we’re supplying here, .generateMipmaps, is beyond the scope of this article series, but you can read all about mipmapping in Metal here. Now that we have a texture, we need to tell Metal how to “sample” from it. The details of texture sampling are somewhat beyond the scope of this article, but essentially, we need to decide what happens when more than one texel is mapped to a single fragment (this process is called minification), or when one texel stretches across multiple fragments (called magnification). These choices allow us to make a trade-off between how jagged or blurry our textures appear when there isn’t a one-to-one mapping between pixels and texels. We’ll discuss how to actually use a sampler state object in the next section. Note that the texture parameter is of type texture2d<float, access::sample>, which means that it is a 2-D texture that we intend to sample from, and when we do sample it, we get back a float4 vector containing the RGBA components of the sampled color. Using the access::sample template parameter requires us to have created our texture in such a way that it can be sampled from. Fortunately, MTKTextureLoader takes care of this for us by default. git checkout step2_6 to view the code up to this point. Up until this point, our little world has consisted of a single, central object, but this approach quickly grows limiting. What we really want, in any game or application of reasonable size, is to represent many objects, positioned relative to one another. One popular way of representing objects and their relationships is a scene graph, which is a hierarchy of objects, related by the transforms that move us from the coordinate system of one object to another. Additionally, we might imagine that we want these different objects to have different materials, expressed as different combinations of textures and parameters. In this section, we will refactor our code to account for many different objects by adding data structures that represent each of the conceptual entities we’ve dealt with so far (lights, materials, and objects), turning them into concrete objects that can be configured and combined into larger scenes. In Metal, we’ll write the specular color and specular power into a new uniforms type, so there is no corresponding Material struct in our shader code. Note that because Swift lacks statically-sized arrays, we explicitly add three lights at the end of the struct. If we want to support more lights, we can always add more here. That completes the refactoring of uniforms. Now we can get back to the business of writing more flexible shaders that take advantage of these configurable materials and lights. This completes our refactoring of the lighting shader to account for differing materials and lights. Now we need to patch up the renderer code to feed in all of those new parameters. This section laid the groundwork for adding multiple objects to the scene and controlling them independently. In the next section, we’ll actually add multiple objects to the scene and show how to position them relative to one another. git checkout step2_7 to view the code up to this point. In this section we’ll develop an abstraction that will help us do two important things: associate materials and geometry with different objects, and express how objects are positioned and oriented in the world relative to other objects. A node, in this context, will be an object that has a transform that specifies where it is located and how it is oriented (this is just another 4×4 matrix). A node may also have a reference to a mesh and material which should be used to draw the node. Crucially, nodes also have a reference to their parent and a list of children, which is what defines their place in the hierarchy. A scene graph, then, is a tree of such nodes 6. First, we create the utility objects we need (the buffer allocator and texture loader). Then we instantiate the scene and configure its lighting environment. Then, we instantiate our teapot node, configuring it with a mesh and various material properties, finally adding it to our scene’s root node and thus adding it to our scene graph. Since we’re updating properties on nodes rather than just calculating transforms on the fly, it makes sense to add an explicit update step, where we do everything time-related. We call this method right at the top of our draw method in order to update every time we render a frame. Finally, we can put some pixels on the screen. Since we’re still going to wind up with one spinning teapot, this might feel like an anticlimax, but we’ve actually created something very flexible here, and we’ll see the power of the scene graph very shortly. At the top, we compute a local model matrix, which is the product of the parentTransform parameter and the model matrix of the current node. This combined model matrix will move us to world space through the model space of our parent node. At the end of the method, we pass this same transform recursively into this method so that the children of this node are additionally transformed by the transform of this node. By descending the scene graph (tree) and transforming each node by the product of its ancestors’ transforms, we effectively position those objects relative to one another. Each node in the scene graph has a name. If these names are unique, we can use them to locate a node anywhere in the scene graph by name. Adding this functionality to our Scene and Node classes is another straightforward exercise in recursion. git checkout step2_8 to view the code up to this point. “Okay, enough with the teapots,” I hear you saying. Let’s create a scene with some action. I’m a big fan of Kennan Crane’s public domain models, so we’ll borrow a couple of them. let bobURL = Bundle.main.url(forResource: "bob", withExtension: "obj")! bob.mesh = try! MTKMesh.newMeshes(asset: bobAsset, device: device).metalKitMeshes.first! Let’s give Bob some friends. 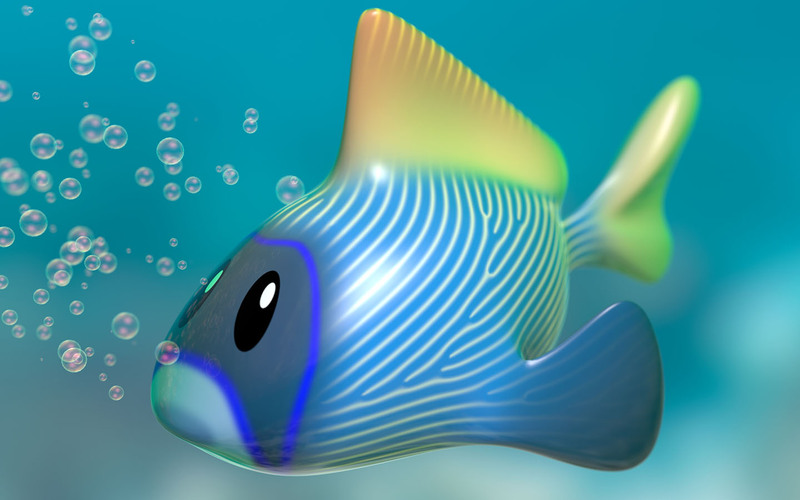 Another Keenan Crane model, Blub, is a blue fish. let blubURL = Bundle.main.url(forResource: "blub", withExtension: "obj")! let blubMesh = try! MTKMesh.newMeshes(asset: blubAsset, device: device).metalKitMeshes.first! Note that we used the nodeNamed method to look Bob up by name. We could also have kept a reference to the Bob node when we created it. git checkout step2_9 to view the final version of the code for this article. We covered a ton of ground in this article. From basic materials and lighting, to texturing, all the way to basics of scene graphs. I hope you’ve enjoyed following along! Feel free to comment below with any questions. One of the most asked questions about Metal is how to draw lines with different widths. Can you make a post how to achieve it in the most efficient way. Please also include an example that can be run on Macs. I actually agree with João – “how to render lines” (straight lines, splines etc) is always a puzzle in different pipelines. I usually end up just building some mesh and so on. What’s the Way to go in Metal2? That would be a great article! It’s a surprisingly subtle art. Mat DesLaurier is a creative coder who has done a lot of work on this subject; I recommend starting with this post, and following him on Twitter. Thanks for writing these tutorials. Greatly appreciated. Really liked your GLTF importer. Can you please write a Metal tutorial integrated with a physics engine. Integrating rendering and physics isn’t my area of expertise, but I strongly recommend taking a look at the qu3e project by Randy Gaul. The architecture is questionable, and the use of old-school OpenGL means it won’t translate directly to Metal, but the engine itself makes for interesting reading. When it comes to rigid-body simulation, a basic implementation should be pretty easily decomposable into distinct steps of simulation and visualization. First, you gather the current state of bounding geometry and transformations in some format that’s easily digested by your physics engine, then you run your simulation, then you apply the resolved transformations back to the scene, and finally render. In a well-designed system, these are entirely separate concerns. Every modern game engine keeps separate copies of state for physics and rendering, so that they can be processed concurrently.